My feet hit the sidewalk. Outside 706 Union Avenue, Memphis. Freeze that day. Slip it under the chronoscope for close analysis. It was a strangely different planet, barely recognisable from the one we inhabit today. But some of us were part of it. Some of us were there. I was six years old, in short trousers, living with my mother and half-brother in Dunswell in the East Riding of Yorkshire, off the main road between Beverley and Hull. More concerned about starting the village school, having transferred from North Hull Infants, fleeing domestic violence from a Seventh Avenue council house. Naturally, at the time, I knew nothing about Sun Studios. No-one did. The ‘New Musical Express’ record chart for that week (3 July 1954) was made up of big clunky easily-breakable 78rpm singles. The Hit Parade best-sellers were headed by the quasi-operatic warbling of Hull-born David Whitfield’s “Cara Mia”, recorded with Mantovani’s cascading strings. It made him the first UK male vocalist to qualify for Gold Disc status. Doris Day was no.2 with “Secret Love” – from her comic-Western musical ‘Calamity Jane’, followed by Johnny Ray’s “Such A Night”, which Elvis himself would later revive for his 1960 ‘Elvis Is Back’ LP. Crooner Perry Como had two titles in the ten – “Idle Gossip” at no.4 and “Wanted” at no.7. While Kitty Kallen’s “Little Things Mean A Lot” was not only the highest entry at no.5, but simultaneously topped the American record sales, radio plays and jukebox charts across the Atlantic. Mellow, sentimental, unthreatening, radio stars were also prominently featured, with both Max Bygraves and the Billy Cotton Band present. It was a staid somnambulistic chart. For it was a soporific time. Barely nine years after the cessation of global war, with the visible reminder there in every city bombsite. Those who’d lived through the war-years – our parents, had had enough of excitement, uncertainty, anger. It was as though the world was tired, emotionally drained, retreating into itself to lick its wounds. Rationing finally ended only this month. Following the revolutionary post-war Labour government of Clement Attlee, a seriously ailing Winston Churchill was returned as Prime Minister. This month his government published plans for civil defence in the event of H-bomb attack, as they simultaneously announce British troops are to be pulled out of their Suez Canal base. Germany won the World Cup in a final against Hungary. And Jaroslav Drobny, a thirty-two year-old Czech with Egyptian nationality, won the singles title at Wimbledon against Australia’s Ken Rosewall. 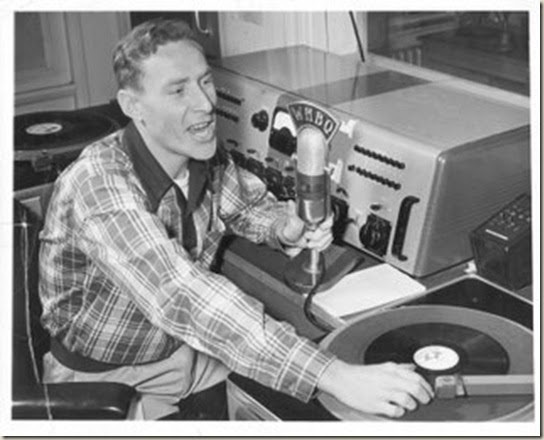 The day’s BBC radio Light Programme broadcasts began with Bob Danvers Walker introducing ‘Housewives Choice’, followed – after the religious ‘Five To Ten’ hymn and prayer slot, by Andrew Fenner at the BBC theatre organ, then ‘Music While You Work’ with the Hugh James Orchestra. In the evening there was twenty-minutes of ‘British Jazz’ by the Tony Kinsey Trio, which was about as hip as it got. The fourth series of ‘The Goon Show’ had ended a month earlier – 11 June, with a ‘Special’ “Archie In Goonland” in which the regular crew were joined by radio ventriloquist Peter Brough and his dummy ‘Archie Andrews’, plus Hattie Jacques, all scripted by Eric Sykes and Spike Milligan. The second series of ‘Meet The Huggetts’ – a cosy radio sit-com with Jack Warner, Kathleen Harrison and Kenneth Connor, had begun in May, overshadowed by the real-life suicide of daughter Joan Dowling, replaced on air by Vera Day. There was one monochrome TV channel, the day’s programming dominated by the second Test Match from Trent Bridge with England v Pakistan. At 5pm Children’s Television featured ‘Little Ig’ the adventures of a prehistoric boy, followed by the evening’s highlight – ‘The Royal’, a visit to the Great Park at Windsor for a preview of the ‘world’s greatest agricultural show’. This day Richard Baker also fronted Britain’s first TV ‘illustrated summary of the news’ – at 7:30pm, a bulletin broadcast live from the faded Victorian Alexandra Palace on the heights of Muswell Hill. There are tales of housewives refusing to sit down and watch him before primping their hair and make-up first. Other forms of fantasy escapism could be found crammed onto the overflowing newsagent’s counter. 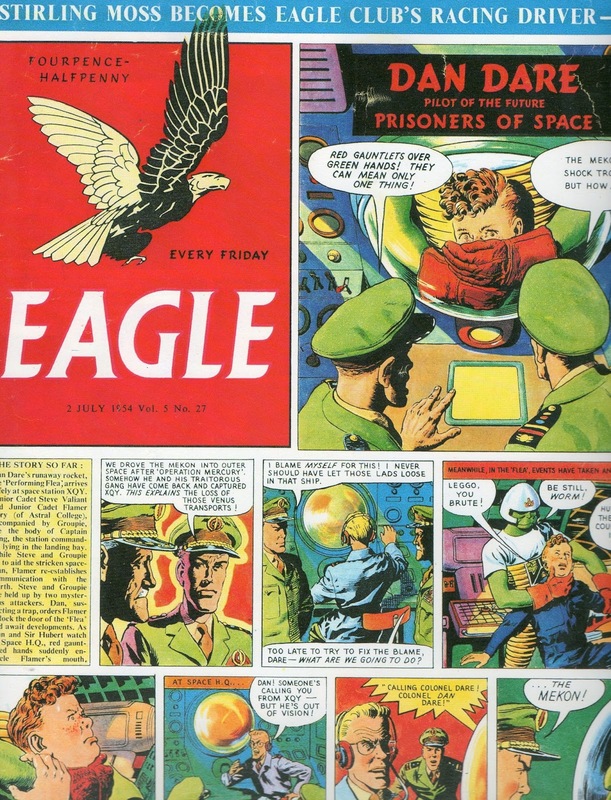 ‘Dan Dare: Prisoners Of Space’ was splashed in vivid colour across the front of ‘Eagle’ – with Steve Valiant, Flamer Spry and Groupie investigating the radio silence of Space Station XQY. This week’s cover sensationally reveals that Flamer – seen on Dare’s screen, is imprisoned by ‘Red Gauntlets Over Green Hands! They Can Mean Only One Thing!’ Yes – ‘The Mekon’s Shock Troops! But How…?’ Read on to discover that the Space Station has fallen foul of the Mekon and his loyal Treen followers. The issue – priced at just fourpence-halfpenny, also includes a photo-spread of Racing Driver Stirling Moss, who had just driven to victory in the first motor race to be held at the new Liverpool Aintree track. 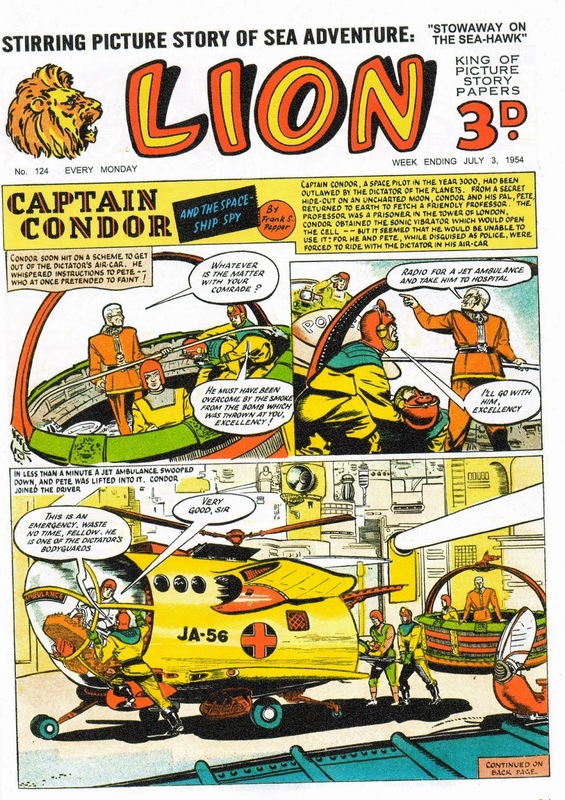 While rival space-hero ‘Captain Condor & The Spaceship Spy’ – striking back at the Dictator tyrant of Earth in the year 3000AD, was on the front of ‘Lion’. I was still too young for both. ‘Mickey The Monkey’ was ‘The Topper’ cover-star, ‘Biffo The Bear’ on ‘The Beano’, and ‘Korky The Cat’ over at ‘The Dandy’. For more adult futures, the dramatic and eye-catching Gerard Quinn cover of ‘New Worlds’ (no.25, July 1954), features a space-suited figure scrabbling among moon rocks with the full splendour of ringed Saturn above. Back then, even the solar system was different. Check out the astronomy books in the local library and it tells you Saturn has just nine moons. They are faint vastly distant objects about which little is known. Following by-pass and orbital probes we now count sixty-two moons, and have dazzling psychedelic photo-mosaics of their exotic surfaces. 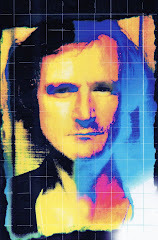 The magazine issue features fiction by Robert Sheckley, plus British writers ER James, Francis G Rayer and a James White novelette “Starvation Orbit”. From the same Nova Publications stable ‘Science Fantasy’ (no.9, July 1954) features Brian W Aldiss (“Criminal Record”) and EC Tubb (“Occupational Hazard”) plus tales by A Bertram Chandler and JT McIntosh. Elsewhere ‘Authentic Science Fiction Monthly’ (no.47, July 1954) features fiction by Kenneth Bulmer – under the alias ‘Peter Green’, while the Book column reviews Arthur C Clarke’s ‘Childhood’s End’, Ray Bradbury’s ‘Fahrenheit 451’ and Robert Heinlein’s ‘The Green Hills Of Earth’. Surely a classic batch of new titles? But Science Fiction wouldn’t hit me for a number of years yet. Sixty years later. My feet hit the sidewalk. It’s sultry-hot outside 706 Union Avenue, Memphis. The street-sign outside now says ‘Sam Philips Avenue’, on the corner of Marshall. There’s a huge white guitar suspended above the green awnings. ‘706’ picked out in black-on-red coloured glass, with a yellow fan around it, above the entrance door. It’s difficult to believe I’m actually here. Here, tell yourself – HERE, is where it happened. This small studio. This very space. You step off the street, through the door, into the hit of coffee. What was once the front office is now given over to merchandising. Yellow ‘Sun’-logo T-shirts, key-fobs and mugs. But this was where Marion Keisker sat, greeting potential artists who walk in seeking recording opportunities. Step up into the small white box-studio. A big photo of the ‘Million-Dollar Quartet’ on the wall, from a few years later. 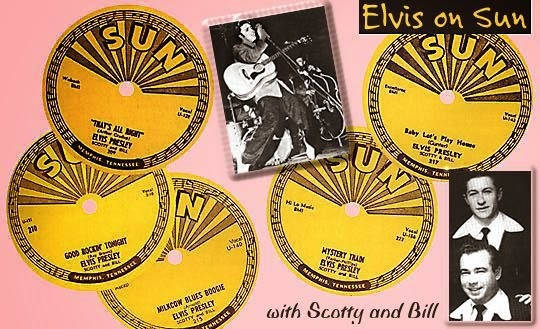 Elvis was signed to RCA Victor by then, but he was always loyal to those who’d helped him. He called in at the studio, where Carl Perkins happened to be cutting “Matchbox” (later picked up by the Beatles for a Ringo feature-item). Jerry Lee Lewis was pumping piano as session-player. Johnny Cash also called round. They jam together. Engineer Jack Clement keeps the tape running. A ‘Memphis Press-Scimitar’ photographer takes this photo. Elvis sits at the piano, looking up over his shoulder at Carl Perkins. As the bright tour-guide in tattoos, green hair and 1950’s-style flared miniskirt narrates, Elvis’ girlfriend Marilyn Evans was sitting on the piano. She was cropped off the photo, but follow Jerry Lee’s eyes to indicate her points of anatomical interest. The guide plays a clip of studio banter from the session, Elvis is telling them how he caught a Jackie Wilson set at Las Vegas, and how Jackie’s version of “Don’t Be Cruel” ‘got much better, boy, much better than that record of mine… I went back four nights straight and heard that guy do that…’ When you see Elvis doing “Return To Sender” in the ‘Girls! Girls! Girls!’ (1962) movie, rumour has it he’s doing Jackie Wilson’s dance moves. Here, now, Elvis’ voice sounds hauntingly natural, conversational. Turn your back, he might be there. There’s a big 1950’s microphone we’re invited to pose for photos with. There’s also a photo of U2, also in atmospheric monochrome. They were here to record “Angel Of Harlem” and “When Love Comes To Town” for ‘Rattle And Hum’ (1988), as a respectful homage to their Rock ‘n’ Roll roots. Stand on this spot, marked on the floor with a black ‘X’. This is where Elvis stood. How can they know…? How can they be sure? Well, he certainly spent some considerable time here. He cut twenty-four tracks here. Both sides of his first five singles. “Mystery Train”, “I Don’t Care If The Sun Don’t Shine”, “I Forgot To Remember To Forget”. And “Milkcow Blues Boogie” where he stops in mid-verse, to slur ‘hold it fellahs, that don’ MOVE me, let’s get real real gone for a change.’ Sleepy John Estes wrote it. Robert Johnson, a Rockabilly Ricky Nelson and a sinuous Eddie Cochran do versions. But it never ever sounds like it does when Elvis ups the tempo and gets real real GONE! There’s also “Baby Let’s Play House” – ‘you may go to college, you may go to school, you may have a pink Cadillac, but don’t you be nobody’s fool.’ And yes, Elvis would get his pink Cadillac. More tracks filtered out over the subsequent years. So chances are that yes, he did step here, at one time or another. Feel the frisson? Feel the magic? Sense the drip of sweat. There’s a mock-up of the WHBQ radio studio from where DJ Dewey Phillips gave that debut Elvis single its first-ever pre-release radio-play on his ‘Red Hot And Blue’ show, 7 July. There’s one big turntable, and the sharp-shard pieces of a shattered 78rpm record on the desk-side floor. If he didn’t like a record, Dewey’d smash it on air. But response was so good he plays “That’s All Right” fourteen times, while Elvis hides out in the local movie theatre, scared and uncertain, fearing the reaction radio-play would bring. He was tracked down, and dragged into the studio. Answered some fairly bland questions in his usual respectful self-effacing manner, unaware that he was being interviewed live. The style? He’d just ‘stumbled upon it’ as he later divulged to the ‘Louisiana Hayride’ host Frank Page. He was always loyal to those who’d helped him. During the filming of his third movie, ‘Jailhouse Rock’ (1957), Elvis flies Dewey Phillips out to Hollywood for a couple of days to spend time on the MGM set. 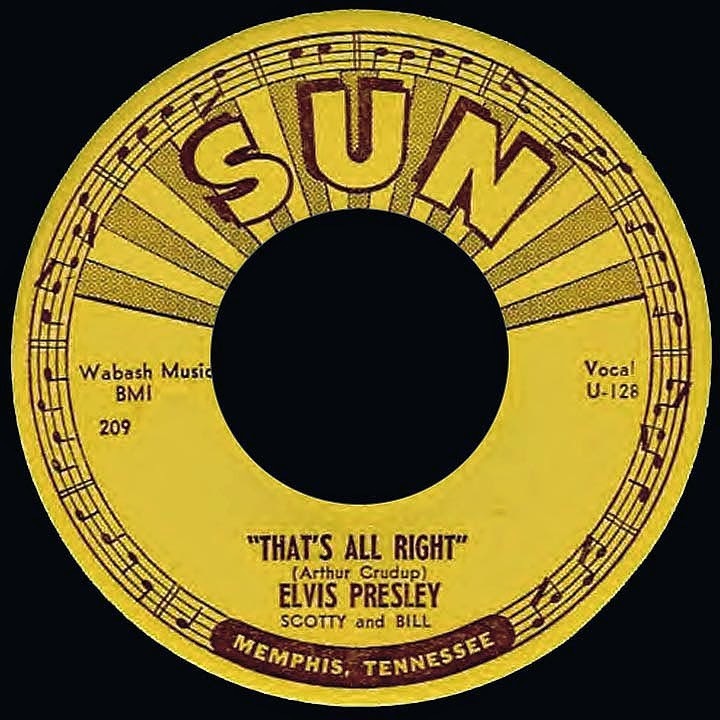 Some time – and an eternity later, Elvis announces “That’s All Right Little Mama” in the sit-down section of his 1968 NBC-TV special, with Scotty Moore’s guitar, and still rips it up convincingly. Stepping back outside onto the Memphis sidewalk, directly across the street, above a Domino’s Pizza take-away, there’s a big billboard announcing ‘Visit Graceland, Only 10 Minutes Away’… For Elvis it was still a little more than ten minutes. But he was on his way.